As a photographer, I have to say that the motor drive (a device fitted to film cameras to facilitate rapid exposures) is one of the cruellest of devices. This is because, as in the image above, a momentary shot frozen in time can portray a subject in an unflattering light. The image above is of Madame Mayhem at the EU Council meeting held on Thursday 20th and Friday 21st October 2016. It shows Madame and Sir Ivan Rogers who was still “in post” at the time. Of the above image, it might in time become as famous (or infamous) as the mezzotint by William Hogarth featured in yesterday’s article. This is because, were it not so serious, the Brexit progress (more accurately lack of) could end up as being superb material on which to base a comic opera! Today is Day 700 from Midsummer’s Day 2016 when the British People woke up to the result of their actions the day before. That effectively NO PROGRESS has been made is staggering! Had this parlous state of affairs had been predicted that Midsummer’s Day it would have been rejected out of hand as being ridiculous. That no government of whatever party stripe would act in such a flagrantly incompetent manner! 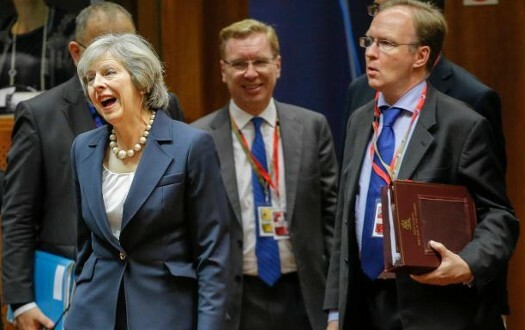 Today, Doctor Richard North in his blog comments upon and provides a link to a speech made in Glasgow by Sir Ivan Rogers on the 23rd May on the subject of Brexit. Sir Ivan’s speech makes sobering reading. The FACT is that IF a crash Brexit occurs, it will NOT be the fault of the EU but entirely the fault of Her Majesty’s Government! Of course, it goes without saying that this will NOT be the opinion of all but one of the members of UKIP!